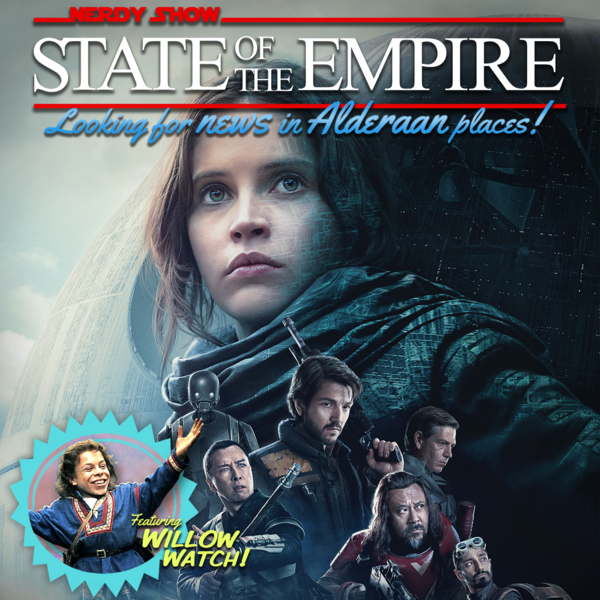 State of the Empire is Nerdy Show’s Star Wars speculation podcast where we “look for news in Alderaan places”. Rogue One is mere days away and the State of the Empire crew might as well be hopped up on spice, given their anticipatory euphoria. We've watched countless TV spots, international trailers, and taken in every shred of content leading up to the release. We've got a list of neat expanded universe tie-ins and details to look for and we've learned a lot about the film, but at this late hour the juiciest stuff is locked safely behind the blast doors for your spoiler-free pleasure. In the meantime, there's actually quite a lot to talk about that isn't Rogue One. Kathleen Kennedy has pulled back the veil a bit on the past couple years at Lucasfilm, surprising new lineage theories for Rey, more hints to an Obi-Wan film and casting news from Han Solo, big things happening in Star Wars Rebels, new info on the next Star Wars Battlefront title and Visceral's forthcoming game, Matt's strange Star Wars story from a 7-11 at 2am, and much more! We'll see you later in the week with our reactions to Rogue One!